Dracula's Castle in Super Smash Bros. Ultimate. Dracula's Castle (ドラキュラ城, Dracula Castle), also known as Castlevania, is a stage in Super Smash Bros. Ultimate. It is the home stage of Simon and Richter. They're both fought here in their unlock battles. Dracula's Castle features two platforms to the left and right that move up and down. All the way to the right side is a set of stairs whose bottom half is broken off. Candles in the background can be destroyed, dropping items. Each end of the stage is surrounded by the darkness. Dracula's coffin appears in the background. When hazards are turned off, the two platforms do not move and the candles never appear. 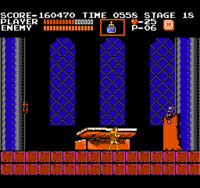 During gameplay, various boss characters from Castlevania will make an appearance, including the Creature (also known as "Frankenstein's Monster", from Frankenstein by Mary Shelley) with Flea Man (also known as "Igor"), Mummy, Medusa, Werewolf, Carmilla (in her giant mask form from Simon's Quest), and Death. Each enemy has their own entrance based on how they appeared during the original boss battle (such as Werewolf leaping through a window). The silhouette of Kid Dracula from the Kid Dracula spin-off series appears occasionally. All these characters stay in the background, which means they don't interrupt the fight at all, even with stage hazards turned on. When the moon disappears in the darkness and bats gather around Dracula's coffin, lightning will flash, revealing Dracula's shadow or Kid Dracula's shadow in the middle of a castle. Dracula himself appears as a boss in Adventure Mode: World of Light in a boss arena resembling Dracula's Castle, but with a flat and empty layout. The Ω form and Battlefield form is set on a completely flat version of the normal form's main platform that is also resized and reshaped to match Final Destination and Battlefield, respectively. The stairs and candles are absent, and on the Battlefield form there are also three soft platforms that remain in place. Simon fighting Dracula in the original Castlevania. Throughout the Castlevania series, the top of Dracula's Castle is the endpoint of the protagonist's journey, where they fight the main antagonist Dracula. Dracula's Castle is always a large structure full of horrifying monsters and tortuous rooms; in the background is the clock tower, a recurring area in the Castlevania games. Candles are a common element in the Castlevania games and are broken to reveal whip upgrades, hearts, food, and items. Every time Dracula's Castle is destroyed, it magically rebuilds itself every hundred or so years, along with a reincarnation of Dracula. This final area usually has the same structure: A long stairway leading to a short hallway, finally ending with Dracula's quarters. The Smash stage condenses this, making the staircase lead directly to Dracula's room. The broken staircase may be a reference to Symphony of the Night, where the staircase is broken into two pieces for most of the game. Lightning flashing on the stage, showing Dracula's shadow. 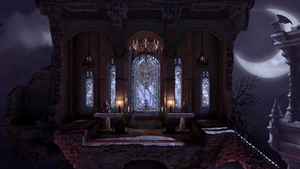 Areas of Dracula's Castle appear as various stages in Castlevania Judgment. This technically makes it one of six stages in the Super Smash Bros. series to be featured as a stage in other fighting games, the others being the Fountain of Dreams, Green Hill Zone, Pyrosphere, Suzaku Castle, and Midgar. Dracula's Castle is the only new third party stage to appear in Ultimate before DLC. This page was last edited on April 16, 2019, at 01:27.